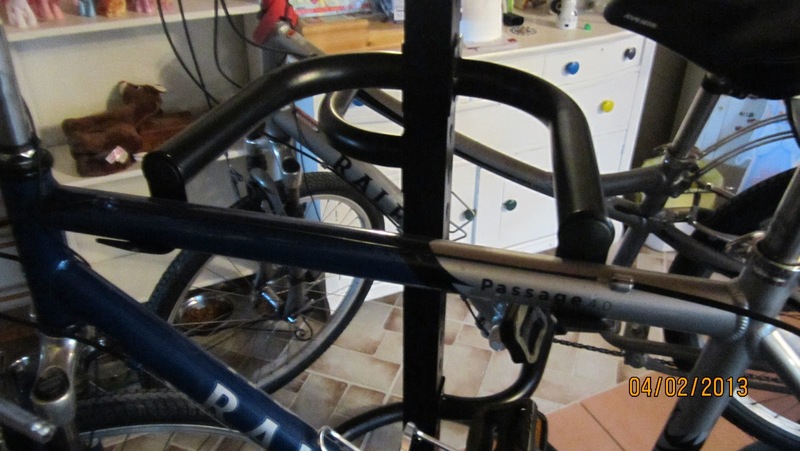 ThemeParkMama: Racor Freestanding Bike Rack Review and Giveaway! Being that I have a huge family, we have a lot of bikes. And, well, they take up space along with falling over and banging each other up. 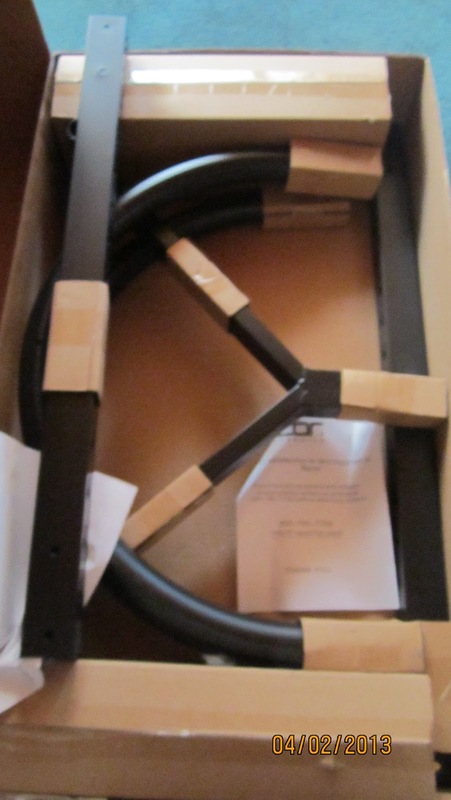 I hate going to get my bike or a kids bike and having to move the others out of the way so it was a great relief to get Racor's PLB-4R Freestanding Bike Rack. 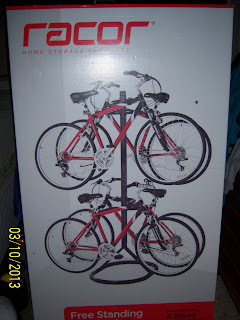 The Racor Freestanding Bike Rack can hold up to 4 bikes with a total weight of 160lbs! The rack came in a box and was very easy to assemble. 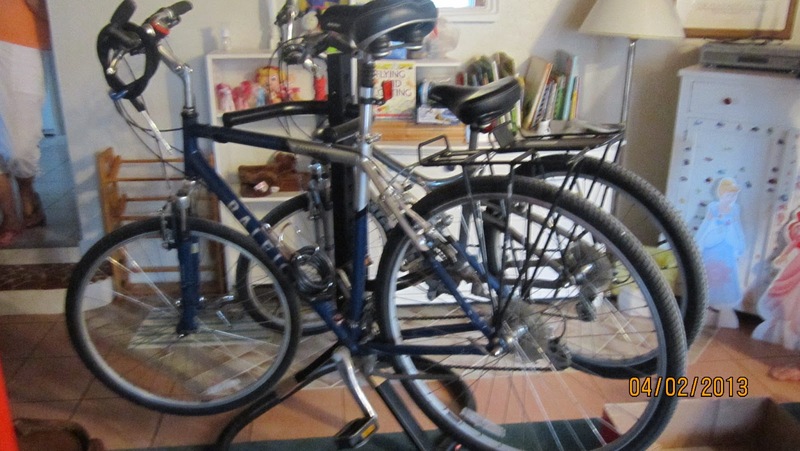 I had our bikes in the den of our house which I only placed 2 bikes on it for pictures. I am one not to read directions when setting things up and it took me only about 5 minutes to connect the pieces. It took a little longer to figure out the placement of the arms, which once I figured out what I was doing it was fairly simple. Each arm of the bike rack is placed by slipping the arms into the 2 holes on the post and turning the heads accordingly. I am very pleased with my Racor Freestanding Bike Rack. It is a great fit and helps with a need we have had for some time now. Racor also carries many other items like the PLB-4R Freestanding Bike Rack they have lifts which you can store totes, bikes or so on up hanging from the garage ceiling! Now talk about saving space. Racor also carries other storage devices for all your organization needs so let Racor help free up some much needed space. In other words, take back your garage! 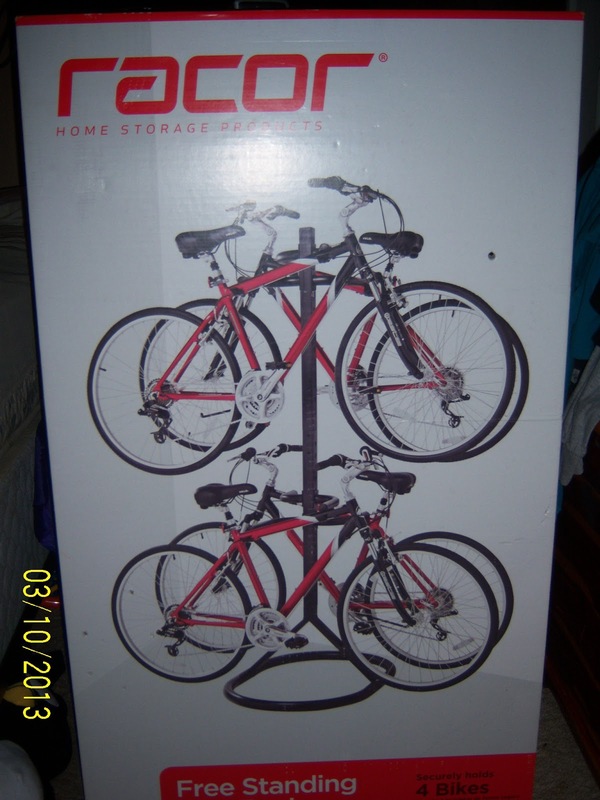 Enter to win a PLB-4R Freestanding Bike Rack just enter the rafflecopter form below! Contest ends 4/24/13 open to U.S. residents only. 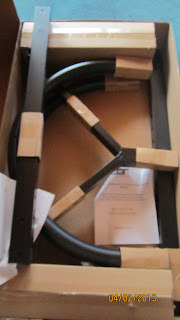 Disclosure: I was given A Bike Rack from Racor to help with my review. All opinions are 100% mine. I like that it can hold up to 4 bikes. That would be great for my family! Thanks so much for the fantastic giveaway! I like that it is easy to assemble and will allow me to minimize the space needed to store our bikes. I like that this rack would help me get the bikes in my garages organized and that is is freestanding, so I could move it as needed. I like how easy this is to put together, it would get alot of use in my household.